Based on an obituary I found in the Buffalo News, I learned that my great-great-grandmother, Bridget (Sweeney) Cruice, has a service for her death at the Church of the Annunciation in Buffalo. I found information on both of your grandparents, although the books do not tell very much. It just says Patrick age 45 died on April 20, 1896 and was buried at Annunciation. 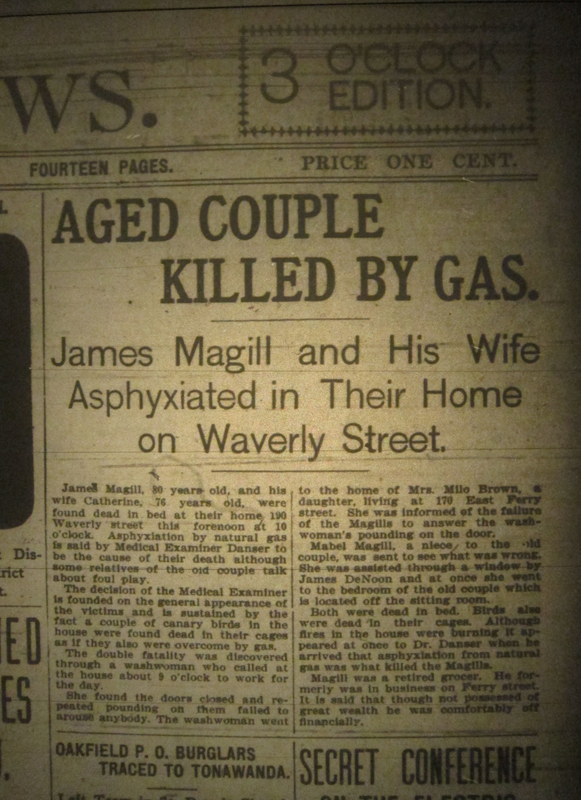 Bridget was 63 years old – died January 25th and was buried on January 28th, 1924. I also found a Josephine Cruice who died on March 24, 1896 at 2 years old. Don't know if this was their child or not, that is the only information in the book, but that name is not very common. Hope this helps – but nothing tracing the family back to Ireland – some of the other books tell where people were from, but unfortunately the books that your relatives were in do not have that information in them. In checking a little further, I found a baptism certificate for Ann Cruise (for some reason everything for your grandparents that I found has the last name spelled Cruise with an S not Cruice with a C. – She was the child of Patrick Cruise and Brigetta Sweeney Cruise. Born on April 22, 1896 and baptized on May 2, 1886. Godparents are Hugo Higgins and Maria Fahey. I will send you a copy of the certificate if you send me your address again. Perhaps the most interesting piece of information is that the last name is spelled Cruise, not Cruice on some documents. In regard to the petition Order that will be signed by the Judge and the format posted here previously, the law clerk said that they plan to add a section that I need to complete application forms and pay any fees (which was what the NYS Attorney General asked be inserted into the order). Following is the format I use for my Declaratory Judgment (One and the Same)and final Order. I have seen other One and Same formats online that are different, but this one seemed to work in my case. 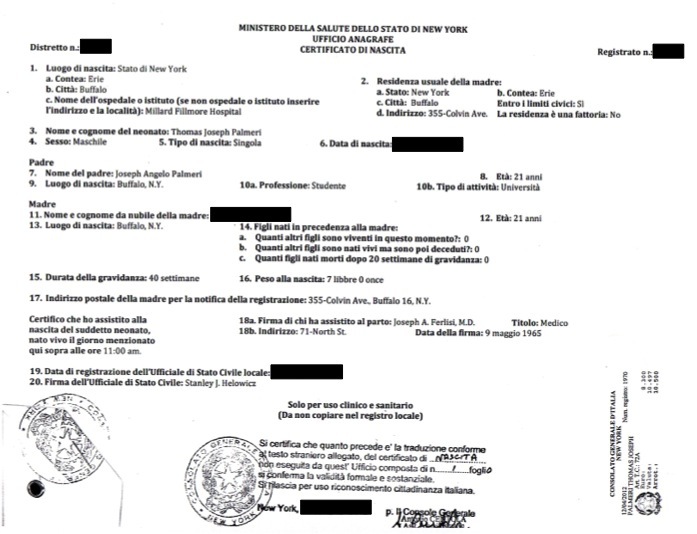 We received authentications from the NY consulate for my birth certificate and our marriage certificate for my jure sanguinis application and for my wife's birth certificate for her jure matrimoni application. Basically, they stamped and dated the translations and attached them to the apostilled documents. Now waiting for my applications for citizenship to be approved. Then we will apply for my wife's citizenship. I ordered the death certificate for my great-great-grandfather, Patrick Cruice's, brother, James Cruice. I was hoping to get some more information about the Cruice's parents. Here it lists their father, my great-great-great-grandfather, as James Cruice, confirming a marriage record I found online. It's a bit unclear what the mother's name is. Before, I had Mary Golden. This looks something like Mary Goulor or Goulon – perhaps a french name, since the Cruice's supposedly escaped the French Revolution. 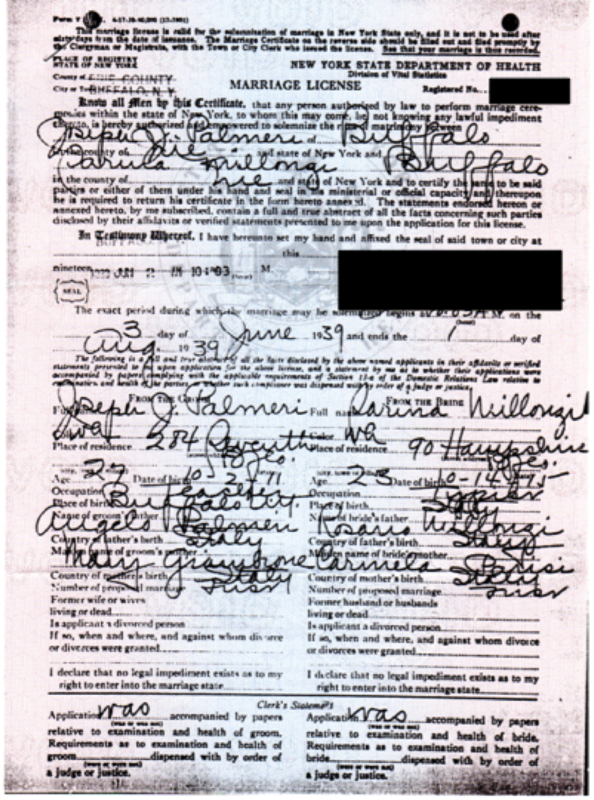 The informant for James' death certificate was Mrs. P. Cruice, who would likely be my great-great-grandmother, Bridget (Sweeney) Cruice. Growing up, I always heard stories that we were somehow related to Bishop Burke. 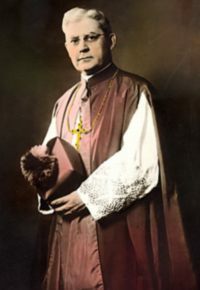 He was Bishop of Buffalo from 1952 until his death in Rome in 1962 while attending the Second Vatican Council. Finding my great-great-grandfather's death certificate has given me some confidence about the relationship between my family and the Bishop. 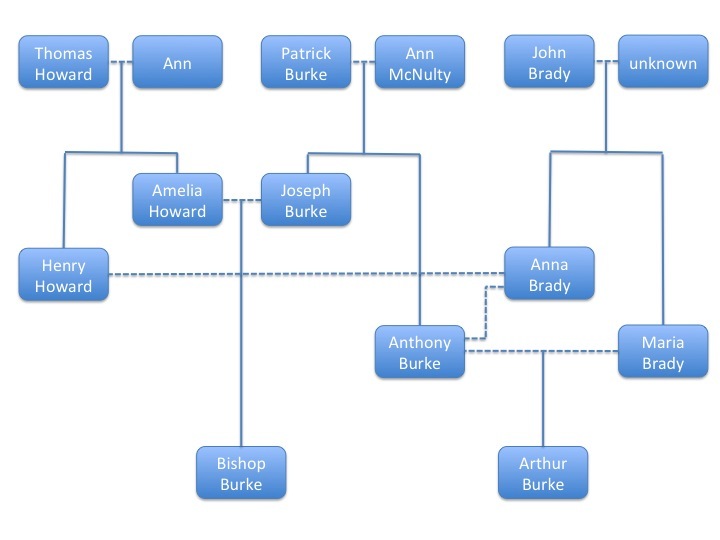 It appears that Anthony Burke was the brother of Joseph Burke, the father of Bishop Burke. I knew that they were close – possibly first cousins – based on correspondence my aunt had from the Bishop. 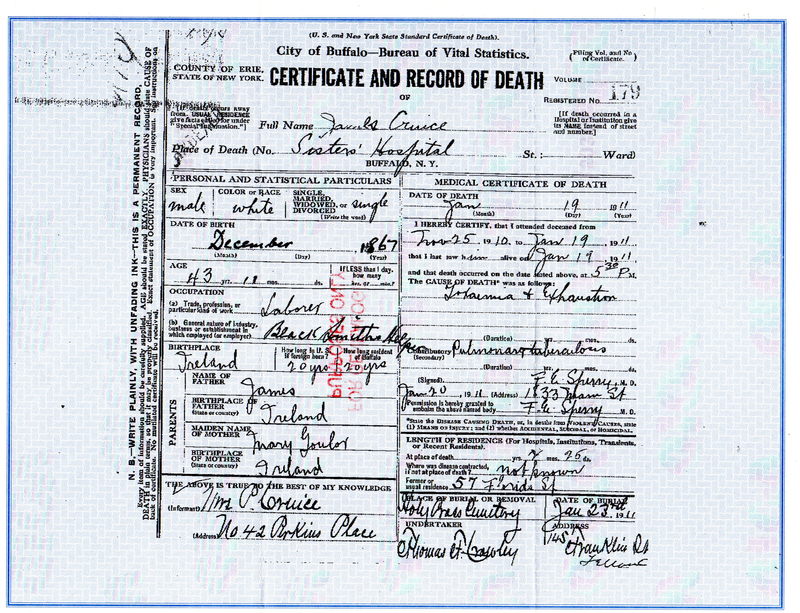 Joseph Burke's death certificate only listed his father as Patrick, his mother was unknown. My great-great-grandfather, Anthony's death certificate lists his father as Patrick and his mother as Ann McNulty. It's likely they were brothers, making my great-grandfather and the Bishop first cousins. 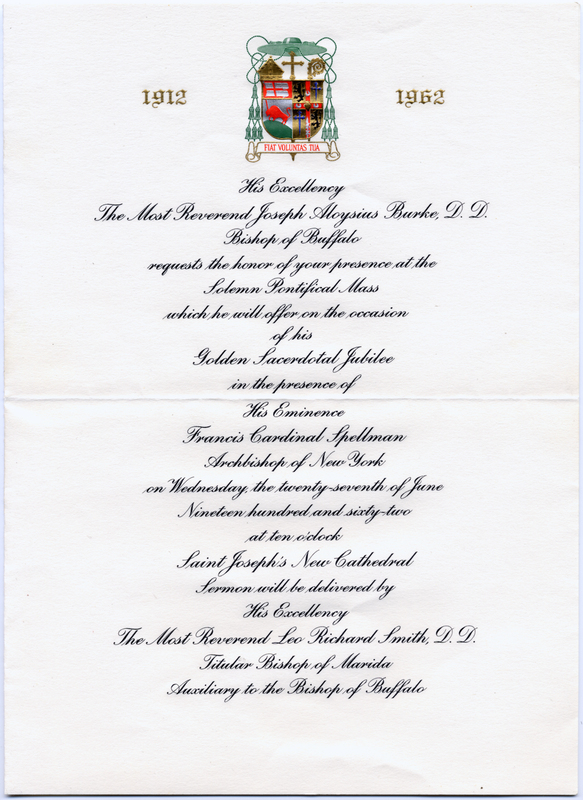 So Bishop Burke's father, Joseph, was my great-grandfather's uncle. 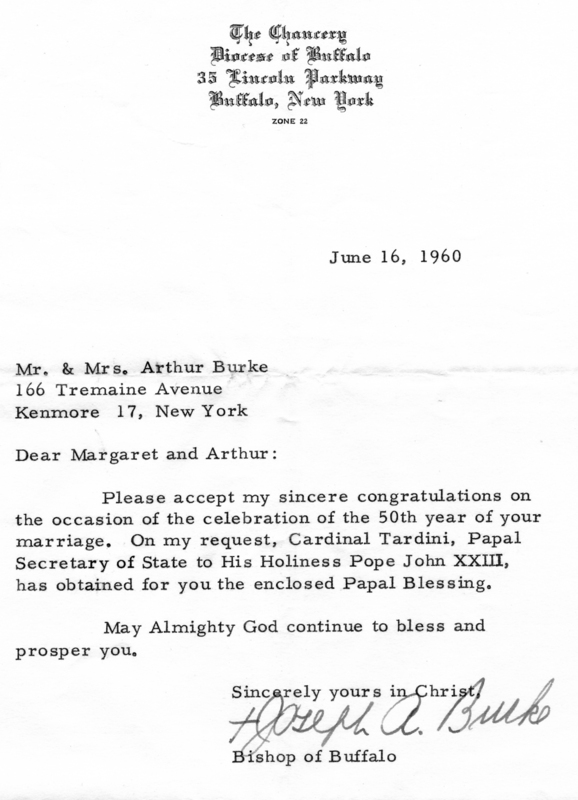 And Bishop Burke's mother, Amelia, was my great-grandfather's step-mother's sister-in-law. Not quite "two brothers married two sisters" either but it makes some more sense now. My great-great-grandfather, Anthony Burke was born 14 Dec 1849 in Ireland and died 3 Jan 1931 in Buffalo. His death certificate lists his wife as Anna Howard. The mother of great-grandfather, Arthur Burke, from his birth certificate and death certificate, was Maria Brady. The 1905 NY Census listed an Anna Howard living with an Arthur Burke; both were living with Thomas and Laura Sullivan. Anna was listed as a "mother-in-law" and Arthur was listed as "stepson" of the head of house, Thomas Sullivan, on the census. The 1910 US Census lists the same family, now with an Anna Burke listed as "mother-in-law" and an Arthur Burke listed as "brother-in-law" to the head of house, Thomas. 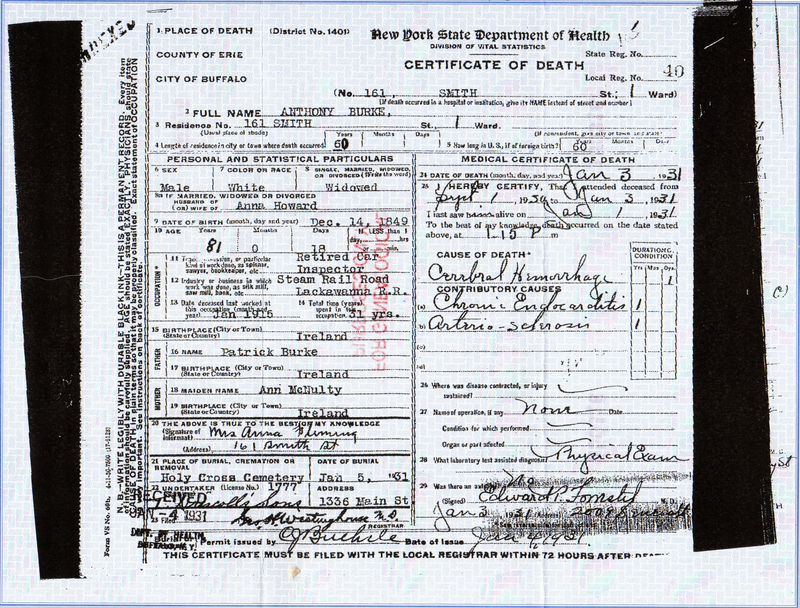 That Laura Sullivan was born Laura Howard, daughter to Anna Brady and Henry Howard, based on her death certificate. Anna Brady married and became Anna Howard and gave birth to her daughter Laura Howard in 1873. Hence her being listed as "mother-in-law" on the census. One likely possibility is that Anna Brady and Maria Brady were sisters. Anthony married Maria and they had Arthur, my great-grandfather. Maria died while Arthur was still a child. Anna's husband Henry must have also died young. Then Anthony married his sister-in-law Anna, his decreased wife Maria's sister. Following tradition, she would have retained her married name and been known as "Anna Howard" when she married my great-great-grandfather, even though she was born Anna Brady. So the "stepson" on the 1905 NY Census for my great-grandfather is for his relationship to Anna, not his relationship to Thomas. And he is a brother-in-law of sorts to Thomas – more of a step-brother-in-law. That would help explain my mother's claim that "two brothers married two sisters and then two of them married each other when their spouses died". It's not quite that, but the story makes some sense. It is possible that Maria Brady and Anna Brady are the same person, not sisters – as in, Maria Anna Brady first married Henry Howard and then married Anthony Burke. That seems unlikely to me given the story my mom told about the Burkes. And it does not jive with the "stepson" notation on the 1905 census. But until I find birth, marriage, and death certificates for Maria Brady and Anna Brady, this will need to remain a possibility. Oh, and I believe that the Mrs. Anna Fleming, listed as informant, is Anthony's sister Anna G. Burke, who died in 1962. Given that Anthony died at 81 years old, Anna must have been both a lot younger than Anthony and died very old. Also, assuming this is his sister, then there is very high confidence about the parents names (Patrick Burke and Ann McNulty); Joseph Burke's death certificate listed Patrick but the mother was unknown. Application number, prefecture (I think probably Catanzaro – which must be the associated "state" office with our home consulate in San Sostene, Catanzaro), and the date the application was presented/sent. The application number is also associated with a type ("tipo) of either K10 or K10/C – I need to research this a bit more. 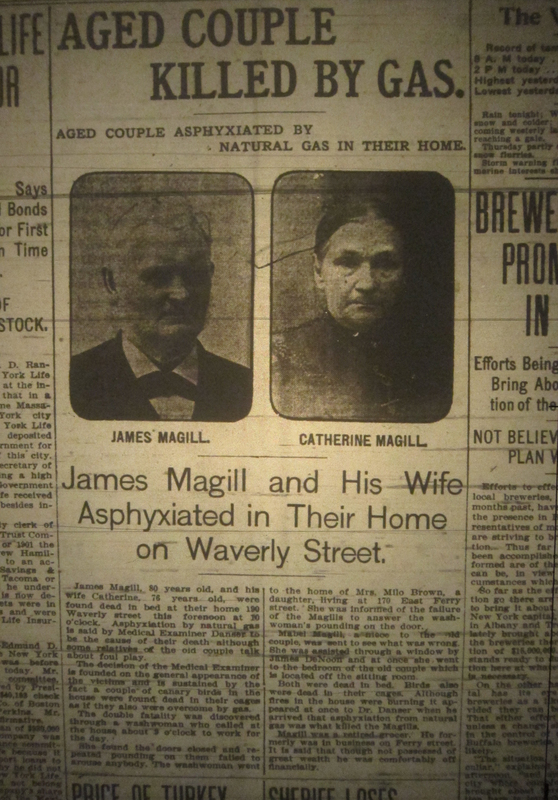 Searching the obituaries today, I found not only the obituary for my wife's great-great-great-grandparents, James and Catherine (Oliver) Magill, but also a front-page story about their deaths due to asphyxiation in the Buffalo Evening News. 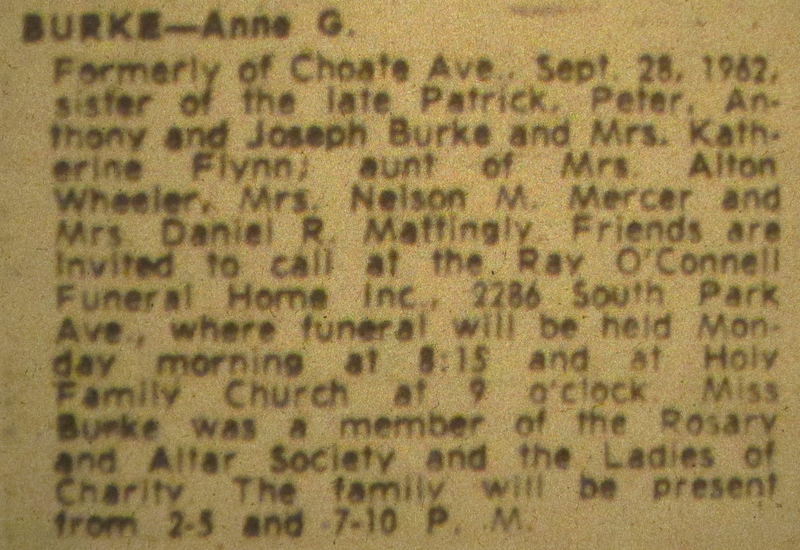 I found the obituaries for Patrick Cruice and Bridget (Sweeney) Cruice. 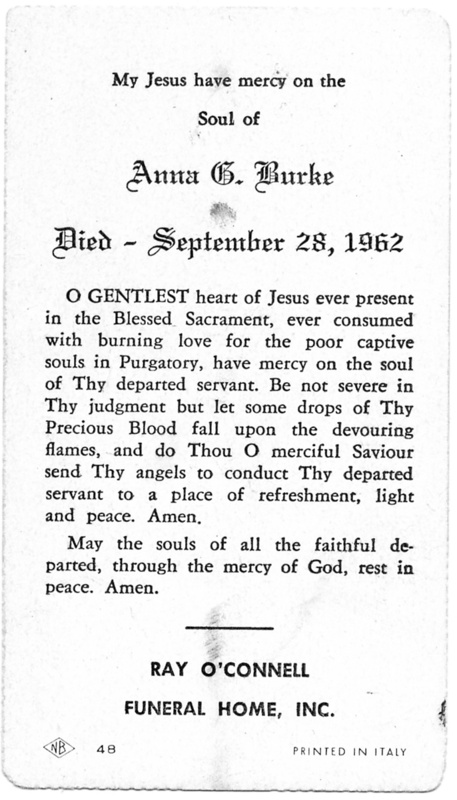 I found the obituary for Anna G. Burke from 1962. At first, I thought this person, however unlikely, could be my great-great-grandmother. A memorial card for her funeral was in records my aunt had, and we thought (and now know) that my great-great-grandfather (Anthony Burke) had a wife named Anna. But it turns out that this was Anthony's sister, not his wife. She must have been quite old since Anthony died in 1931 and he had outlived his brothers. This lists her brothers as Patrick, Peter, Anthony, and Joseph. 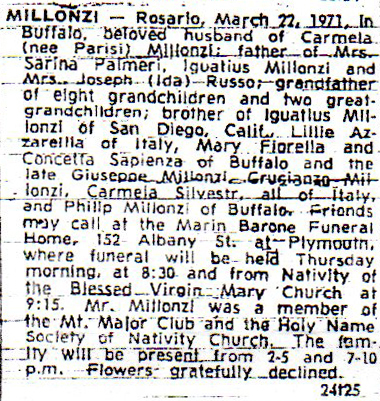 Anthony's obituary also listed a brother Michael. This lists a sister Katherine (Flynn). Anthony's listed sisters Jane and Mary. I'm going to try to get her death certificate in September, after 50 years have passed, and it becomes a public record. I went to the Buffalo library downtown and searched for obituaries. I found one for my great-great-grandfather, Anthony Burke. He died 2 Jan 1931. His wife predeceased him and her name was Anna. It's still unclear if her name was Maria Anna, since "Maria" was the name on Arthur's birth certificate, or if Anna was his second wife and Maria was his first wife (and if the two of them were sisters). One sibling was Anna (Fleming), who was still alive at the time of his death, and could have possibly lived until 1962 (Anna G. Burke). Siblings who died before him were Patrick, Peter, Joseph (probably the father of Bishop Burke), Michael, Jane, and Mary. The authentications/legalizations for my birth certificate and marriage certificate arrive today from the NY Consulate. Mailing them off to the Detroit Consulate. Hopefully this will make everything official. I had emailed some churches looking for my grandparents' marriage certificate. Someone at one of the churches I wrote actually did some research for me – finding a bunch of things out I already knew, but it was really generous of them to do the searches. 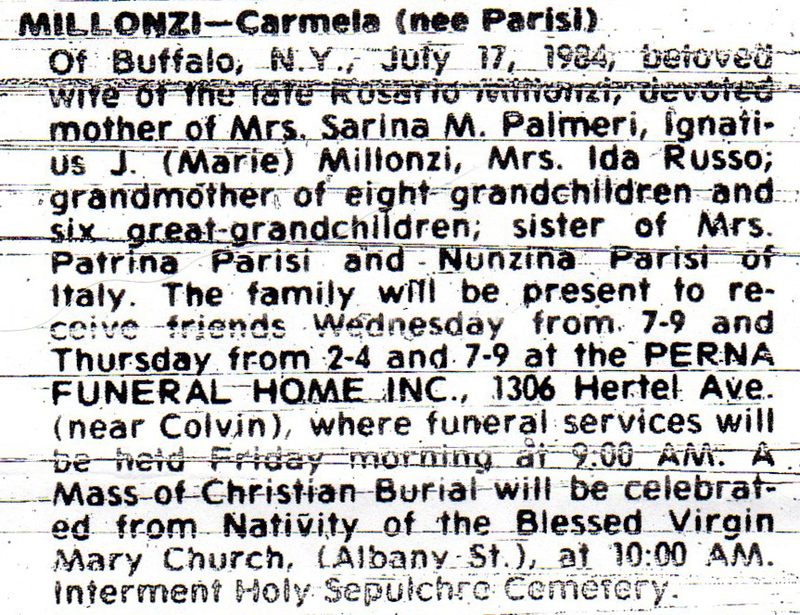 One things they found that I didn't have was my great-grandparents' obituaries from one of the Buffalo newspapers. The one thing these list is names (including married names) of siblings. I had them for my great-grandmother's siblings, but I didn't have them all for my great-grandfather's siblings, and I wasn't sure how many siblings he even had. Turns out a couple I thought were his sisters must have been cousins. They immigrated with my great-grandparents, listing right before them on the Ellis Island manifest, but they were either his cousins or nieces or something. I wanted to share some details of the story of how I finally found my grandparents’ marriage certificate. When I started my document gathering in September, I first focused on what I thought would be the “harder” documents to get, like my great-grandparents’ Italian birth certificates and their marriage certificate, my great-grandfather’s naturalization records, and the like. I left the “easy” documents to later, in part to spread out the cost. Well, my grandparents’s marriage certificate was not easy. I’ve mentioned many of these details in other posts, but I thought I’d collect it all into a single story. First, my grandmother is 96 years old, in a nursing home. My aunt was unable to find a copy of her marriage certificate in my grandmother’s records. Requesting the document was a challenge. In NY State, and probably many states, you cannot order a certified marriage certificate unless you’re a spouse, unless both spouses are deceased. That’s a challenge if one of the spouses is very elderly, in a nursing home. Fortunately, my aunt has power of attorney. But the state requires a copy of my grandmother’s photo ID. Well, my grandmother never drove and never had a driver’s license, and hasn’t had a passport since the 1960s (which has long since disappeared). (So despite what George Will says, there are lots of legal US citizens, many poor or elderly, who have no photo ID.) Without an ID, you can mail a utility bill, in the person’s name, and a letter from a government agency, in the person’s name. That’s a challenge if someone’s in a nursing home – they have no utility bills. The best my aunt could do was a bill from the nursing home addressed to my aunt with a RE: my grandmother and my grandmother’s retirement check addressed to my grandmother at my aunt’s address. Fortunately, this was enough for the state to release the marriage certificate. Second, no one was certain about the date of their marriage. Sadly, my grandmother could not help. We were able to narrow it down based on when my aunt and father were born, and based on a comment I remembered that my parents could have been married in the 25 year of my grandparent’s marriage. What this means is that the request only included a 3-year search range, not an exact marriage date. i suppose that’s an invitation for a “no record found” since searching over years requires some diligence. My aunt sends the request off to the City of Buffalo. And we get “no record found”. That’s odd since we knew that both my grandmother and grandfather lived in Buffalo. And it’s almost inconceivable that they would have gotten married anywhere but one of the Italian Roman Catholic churches on the West Side of Buffalo. So we try three tacks. First, my aunt mails off a request to NY State. We originally requested through Buffalo because it’s $10 rather than $30, and a lot quicker. Second, I send letters and emails off to just about every city and town clerk around Buffalo, on the off chance that they might have gotten married elsewhere. Third, I send letters and emails off to just about every Roman Catholic Church in Buffalo and the neighboring communities. We knew the church that my father was baptized in and that my grandfather was baptized in. And my grandmother’s cousin knew the church that my grandmother was active in as a young adult. None of the towns and none of the churches had any record of my grandparent’s marriage. So now I broaden the search even further. I try Niagara Falls. Who knows, maybe they wanted to have a reception in the Falls and got marriage in a church in the Falls – at that time, there was a large Italian community there as well as Buffalo. Nothing from them. I’m stumped. I ask my dad, my aunt, and cousins again. Everyone mentions the churches we already tried. One of the churches suggests that we try to contact the church that my grandmother was baptized in since that church’s records might note where and when my grandmother was married, even if it wasn’t in that church. Well, my grandmother was born and baptized in Sicily, so that does not seem like an easy option. I do email my grandfather’s baptismal church, but they have no record. I email one of my cousins who was a bit of a family historian before I took over doing genealogy. He said, you know, the Nativity of the Blessed Virgin Mary was your great-grandparent’s church – my GM’s church. Well, that church closed down years and years ago. I ask my dad. He says, sure, that was my mom’s church; didn’t I tell you that. He didn’t. But I’m happy to have a new lead. So I email a few churches and ask if they know if any church might have a record for NBVM. One does. I email that church. They email me that they found the record – I receive that email two hours after my visit to the Detroit consulate. They mail me my grandparent’s marriage record. Now I send a copy of that back to the City of Buffalo, along with a copy of their certified “no record found” they had sent my aunt. A couple weeks later, I get a certified copy of their marriage certificate. And a few days after that, my aunt gets their marriage record from New York. I guess one irony is that if I had just mailed NY months ago, and waited, and waited, and waited, I would have gotten their marriage certificate anyway (since we did). But of course, when we’re going through this process, you get a heightened level of impatience. And especially when I knew I had my March consulate meeting, I was working hard to try to find their marriage certificate, my only missing piece. Another irony is that Detroit ended up not requiring my grandparent’s marriage certificate – accepting the “no record found” (along with my grandfather’s death certificate) as sufficient. 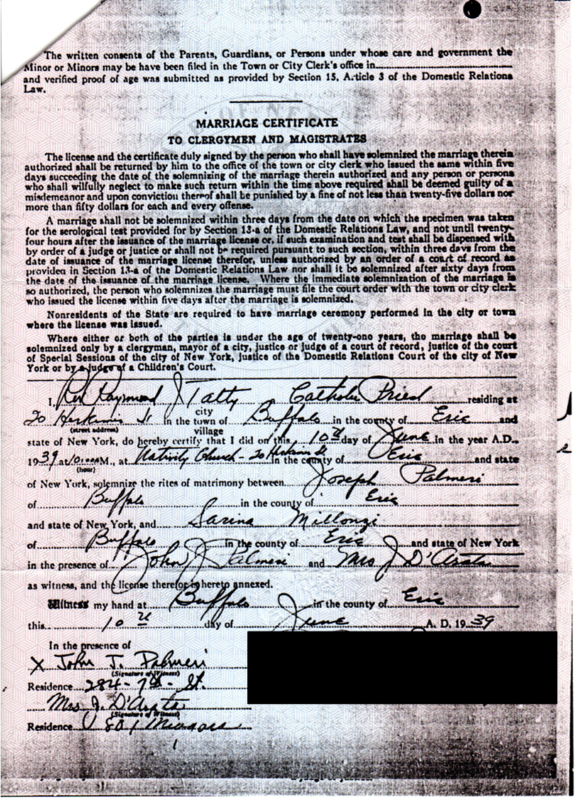 After lots of effort over the past several months, my grandparent's marriage certificate finally arrives from NY State. After I received the marriage certificate from the church, I sent back the "no record found" to the City of Buffalo (along with a copy of the church's certificate). Today they sent me the certificate. I guess now they actually searched a bit harder. … now I need to mail the apostilled certificate and translation off to the NY Consulate for authentication/verification.